Here in Bermuda we have a country of at least two different cultures and varying socio economic circles. One of our major divergences of views is between how many involved in International Business [IB] perceive Bermudians and correspondingly how Bermudians perceive IB. Over the next few months we will be taking a closer look at IB and speaking with many of the persons, both guest workers and Bermudians, involved in this industry. 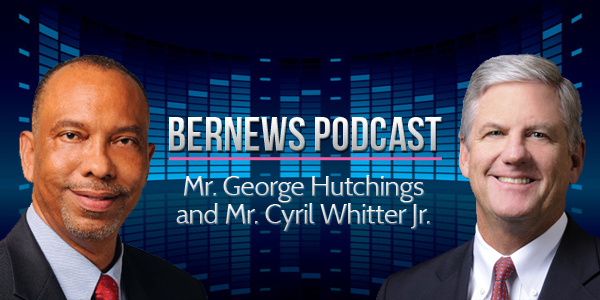 In this first interview I spoke with Mr. George Hutchings and Mr. Cyril Whitter Jr.
George Hutchings holds the position of Senior Vice President & Chief Operating Officer of Oil Insurance Limited for The OIL Group of Companies in Bermuda. Prior to his OIL appointment, George held the position of Senior Vice President & Chief Operating Officer of Oil Casualty Insurance, Ltd.
Cyril Whitter received his formal accounting training at The Bermuda College where he received a Diploma in Accountancy in 1978. He then joined Jardine Pinehurst Management Company Limited as an accountant specializing in the management of captive insurance companies and was appointed Senior Vice President in 1991. He remained at Jardine Pinehurst until 1993 when he joined Independent Management Ltd.
20 minute podcast with Mr. George Hutchings and Mr. Cyril Whitter Jr. In the next podcast we will be speaking with the individuals and organizations dedicated to growing IB. IB provides 85% of our much needed foreign currency earnings, provides the biggest chunk of payroll taxes, contributes $900mn annually to the local economy, provides jobs and opportunities to locals, grants scholarships to local students and funds numerous charities. What does Chris Famous provide to Bermuda? To be fair,Chris has an audience who may not appreciate the importance of I.B., with this type of exercise they may pay more than passing attention to it. While not a fan of CF, I believe that this is a very positive approach and i commend CF for it. Just listened to the podcast. Thanks for doing this Chris. My feeling is that you really didn’t have the kind of dialogue that you would have wanted to have with them. I am sure 20 minutes limits what things you can get into in a meaningful way. I have to disagree with Mr Whitter on this one point (I agreed on all else), that the opposition understands the significance of IB. This is my FEELING about the opposition and IB. The opposition doesn’t understand it, nor its significance to Bermuda. The generally don’t want guest workers here but only tolerate them because they have to. If they had their way, they would welcome the days of fishing and farming as a way of life. Right or wrong, that’s my view of their view of IB. There is a ground swell of emotion within grass roots organizations that are very much anti-IB. They don’t think that they are connected to it in any way and that if it left Bermuda, their lives wouldn’t be impacted. They don’t understand how IB money circulated throughout the economy and into their pockets. Again, 20 minutes is no time to really have that kind of discussion but I do think that we need to have it, the rhetoric needs to be toned down, for the most part Bermudians need to re-learn what it means to compete for jobs and to provide a first class service. Our culture and work ethic at the moment is not healthy and it is difficult to build a business on Bermudian labour. Ask any local business owner about the challenges with hiring locals and you’ll begin to gets a sense of the depth of our issue. These conversation are important. We need a venue/vehicle where people can be painfully honest about how they REALLY feel on both sides of the fence in an environment that is safe and encourages that kind of dialogue. Until then, truth is often only said in select circles and a resolution and understanding continues to allude us.